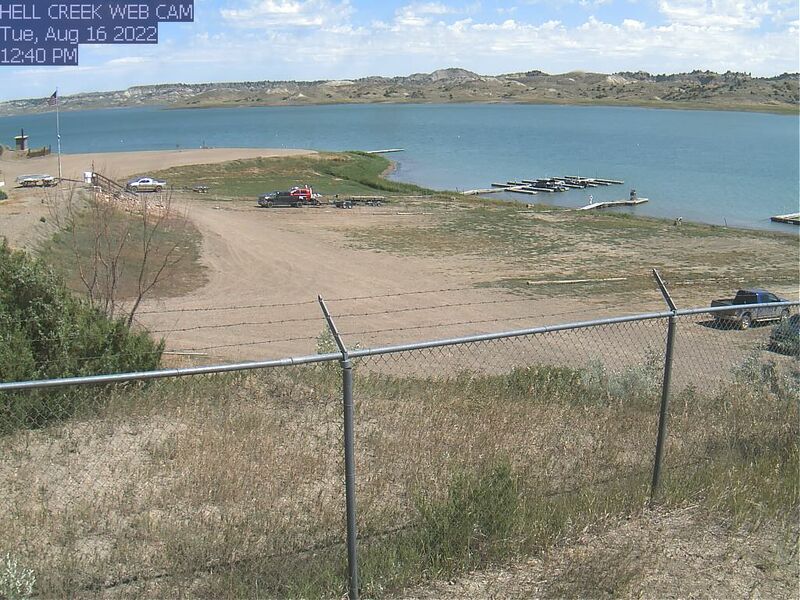 Walleye fishermen on Fort Peck learn quickly to fish structure. The reservoir is made up of a mixture of long points, medium points and short points with bays big and small in between. The waters can run deep clear up to the bank near some points and are shallow flats near others. Don Childress and a 13.25 pounder. 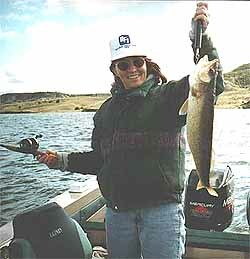 A rule of thumb on Fort Peck is to cover plenty of water to locate walleyes first. 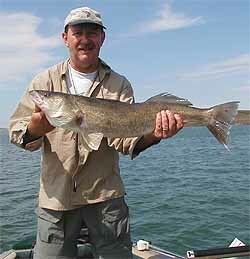 Rather than holding in particular spots, Fort Peck walleyes are great travelers. They’re here one day and gone the next. Because of this, covering water becomes very important, especially during the months of June and July, the prime months for walleye fishing on the reservoir. The primary fishing strategies for the lake at this time of year are pulling crawler harnesses with spinners behind a bottom bouncer sinker or trolling crankbaits. These methods will allow you to cover more water as you fish. Then, when you locate feeding walleyes, you can key in on them and, if you choose, try other techniques like jigs or live bait rigs. The key thing to look for is patterns. Try to figure out what depth is holding the most walleyes. Try to key in on the spinner color they prefer. Pay attention to crankbait finish or trolling speed. When you figure out the pattern, look to duplicate it elsewhere on the lake where you find similar situations. When you start for the day, look to the wave-pounded shorelines and either stained water or mud-lines where waves have eroded the bank and created muddy water. Also, the depth the fish are holding at may vary by the day. Trolling crankbaits with planer boards is extremely effective in testing a number of depths at the same time. They allow you to cut a wide swath through the water until you find the preferred depth for the fish. Good colors for spinners or crankbaits can vary by the day, but chartreuse is always a good choice as a starter as is blue-and-silver. Perch-finish, fire tiger finish and clown finishes also work well on crankbaits. See these and other great fish in our Photo Galleries! us at (406) 234-6342 or send me an e-mail at: Bernie@MidRivers.com.